If you’re in the floral industry — a flower farmer, a wholesaler, an event planner or a floral designer — you’re probably thinking about wedding season, right? In fact, I was recently talking with some of my fellow board members at the Seattle Wholesale Growers Market about planning a wedding event and we all agreed to schedule it before Memorial Day. “Wedding season official starts after Memorial Day,” someone in the group reminded us. If that’s the case, the timing to welcome today’s two guests is perfect. 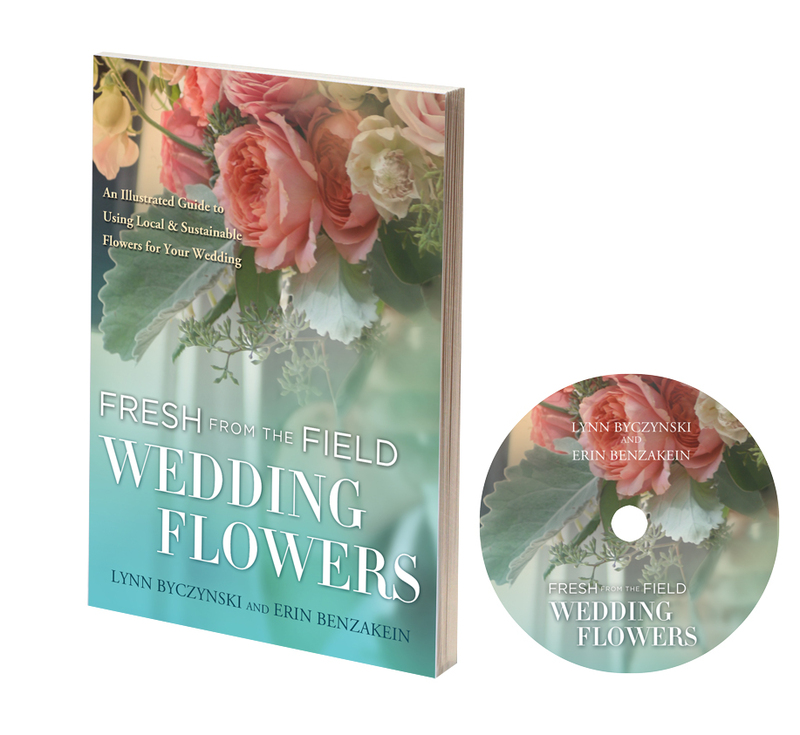 Lynn Byczynski and Erin Benzakein are the authors of a brand new book and companion DVD called Fresh from the Field Wedding Flowers: An Illustrated Guide to Using Local & Sustainable Flowers for Your Wedding. The 112-page book was published in February by Fairplain Publications and is available in print for $40 and for various e-reader platforms. Fresh from the Field Wedding Flowers is a tremendous resource promoting the use of local flowers for weddings. It was created for the eco-conscious couple committed to having a greener wedding, the specialty cut flower farmer who sells flowers for weddings, the floral designer who wishes to get in on the locally grown trend, and the passionate gardener who wants to grow flowers for events. Illustrated with dozens of photographs from actual weddings, this book celebrates the romantic, bold, vibrant arrangements created by today’s top floral designers using local flowers and other botanicals. It informs brides about how to find local growers, what levels of service to expect, and how to stretch a floral budget. It includes advice for DIY weddings, and instruction in basic floral design techniques. Step-by-step photo essays show how to make a hand-tied bouquet, a boutonniere, a mason jar centerpiece, and a large altar arrangement. Lynn Bycynzkski. Lynn is an established flower farmer who has grown certified-organic flowers for florists, supermarkets, a pick-your-own subscription, and weddings. Based in Lawrence, Kansas, where she and husband Dan Nagengast raised their two children on a small farm, Lynn has turned her love of flower farming into a vibrant career as a publisher and author. In 1997, she wrote The Flower Farmer: An Organic Grower’s Guide to Raising and Selling Cut Flowers, which has been credited with helping thousands of people get started growing cut flowers commercially. The revised and expanded version of this essential reference was released in 2008 and it’s still a best-seller. Lynn is also the founding editor and publisher of Growing for Market, a national magazine for small-scale, sustainable vegetable and flower farmers that she has published since 1992. Erin Benzakein. Owner of floret, a flower farm and floral design studio based in Mount Vernon, Washington, Erin met her coauthor Lynn when she proposed submitting an article to Growing for Market. You’ll hear the rest of the story of how that collaboration developed in my conversation with the two. Today, Erin is a flower farmer, a designer and writer whose popular blog features original photography and chronicles the daily life of her family- and flower-centered business. 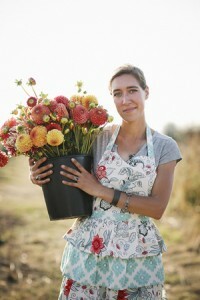 Cut flowers grown on Erin’s farm are sold at Whole Foods grocery stores throughout Washington, Oregon and Canada. Erin teaches floral design and small-scale flower farming workshops and I’ve written about her work for Sunset and Country Gardens magazine. Victoria Magazine and Design Sponge have also featured her in stories. Last fall, I interviewed Erin and fellow farmer-florist Jennie Love in a podcast about their Seasonal Bouquet Workshops. Follow this link to listen to that episode. Because of the support from you and others, listeners have downloaded episodes of the Slow Flowers Podcast more than 9,500 times! I thank you for taking the time to join to my conversations with flower farmers, florists and other notable floral experts. If you like what you hear, please consider logging onto Itunes and posting a listener review. Until next week please join me in putting more American grown flowers on the table, one vase at a time. The Slow Flowers Podcast is engineered and edited by Hannah Holtgeerts. Learn more about her work at hhcreates.net. This entry was posted on Wednesday, April 2nd, 2014 at 6:04 am	and is filed under American Grown, Blog Posts, Book reviews, Creativity, Entertainment, floral design, Gardening, General, Podcast Episodes, SLOW FLOWERS Podcast, Writing. You can follow any responses to this entry through the RSS 2.0 feed. You can leave a response, or trackback from your own site. Thanks for such a timely podcast! It’s so fun to hear from the authos. Ordering the book now! !